The Aloe juice ( Aloe Vera, or even better than Aloe Arborescens ) in addition to being highly appreciated in herbal medicine and in dermocosmetics for its innumerable medicinal properties , is considered by experts one of the best natural supplements for the well-being of our body. This is not only the Aloe is useful to prevent and treat many health problems, but also because it is a very valuable help to give us that extra gear to overcome the stress and fatigue of everyday life. Aloe leaves (including peel) contain in fact a multitude of nutrients such as vitamins, minerals, carbohydrates and amino acids, which make it ideal for all those people who seek an integration, perhaps avoiding synthetic products, such as multivitamins in powder or in tablets. The world in which we live today has inevitably led us to need integration. This is because of intensive farming techniques, the indiscriminate use of pesticides, herbicides and chemical fertilizers, because of the smog and pollution in general, the fruit and vegetables that we grow today and that ends up on our tables, have a very little nutritive power . To this we must also add the commercial policies of large retailers, which all have at heart except the health of the final consumer. The maturation of many fruits and vegetables takes place in cold stores? Often the vegetables and fruit that we find on the supermarket counters are not left to mature on plants or on the ground, but in cold storage. This causes a lack of absorption of nutrients from the soil, already depleted in itself if used for intensive cultivation. For some types of fruit and vegetables it can take months, or even years, from when they are harvested when they are placed on the market. For example, apples are often frozen and returned to the market the following year. And it must be said that many of the vitamins (and in particular the vitamin C), deteriorate with the passage of time.For this reason it is important to consume fresh products. The ideal would be to have the garden behind the house to be supplied directly, or a farmer, or a greengrocer whom we trust blindly, whose products are unquestionably organic, fresh and of the highest quality. Unfortunately, not everyone has this luck. There are those who live in the big cities , perhaps far from the countryside and submerged by the smog, the stress of hectic life and with very little time available for cooking, or to do even half an hour a day of physical activity. Imagine if you have time to look after the garden or the garden! Here is a life of this kind, combined with a scarce amount of nutrients, it can significantly weigh on our body, causing fatigue , a lowering of immune defenses and a greater propensity to get sick and develop serious diseases over time. If you unfortunately find yourself in the scenario I have just described, you will undoubtedly have great benefits in the daily intake of Aloe juice. Let's now look more specifically at the reason why Aloe is considered an excellent natural supplement and a very valid alternative to synthetic multivitamins that you could buy in a pharmacy. In total there are over 200 active ingredients contained in the gel and in the peel of the Aloe leaf. It must be said that there are over 300 varieties of Aloe, but that among all the one with the highest concentration of active ingredients is undoubtedly Aloe Arborescens , which contains a triple content of nutrients compared to the most famous Aloe Vera. Mineral salts : Aloe is extremely rich in mineral salts, so much so that it can boast more than 10 different qualities, including calcium, chromium, iron, phosphorus, germanium, magnesium, manganese, potassium, copper, selenium, sodium and zinc . 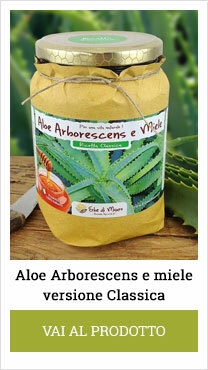 This prerogative attributes to the Aloe juice properties comparable to the most modern multi-mineral supplements. Vitamins : since our body is unable to synthesize them, regular vitamins are essential for the good functioning and good health of the body. In Aloe we find almost the entire spectrum of vitamins available in nature, including the fat-soluble vitamins A and E, and the water-soluble vitamins, such as vitamin C and the whole group B complex (B1, B2, B3, B6, B9, including B12). For this reason, Aloe is comparable to a real natural multivitamin. Amino acids: amino acids are the building blocks of proteins. Of the 22 amino acids present in nature, Aloe contains as many as 20, including 7 of the 8 essential amino acids. Anthraquinones : they are substances present in the most external part of the leaf. They have a laxative, analgesic, depurative, antimicrobial, antiviral, antifungal and anti-tumor action. Aloin, aloemodine, barbaloin, isobarbaloin, cinnamic acid, aloetic acid, crisophanic acid and aloe ulcine belong to the anthraquinone group. Acemannan: are polysaccharides, complex carbohydrates with marked immunomodulatory, anti-inflammatory, antiviral and protective properties against the mucous membranes of the stomach and intestines. It is present above all in the gel. Enzymes : these promote the digestion of some nutrients and it is no coincidence that drinking Aloe juice also helps in the digestion of other foods. In Aloe we find lipase (promotes digestion of fats), protease (helps the body to break down proteins) and cellulase, which facilitates the exploitation of fibers, present in both Aloe and other plants. Salicylic acid : essential component of the well-known aspirin. It is an effective painkiller. The best way to integrate Aloe to our diet is by taking it in the form of fresh juice, by blending the leaf, deprived of the thorns together with organic honey and a little distillate (grappa, vodka, gin, etc. ), as well as also advises Father Romano Zago . 2-3 tablespoons of brandy (or other distillate). To make the juice, these ingredients should be put in the blender and blended together. What is the use of honey and distillate? Honey and distillate are necessary, because in addition to acting as preservatives and improving the taste (aloe is very bitter), they facilitate the absorption of certain nutrients, such as aloin, in the intestine. 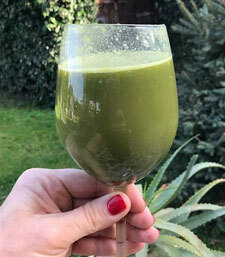 Aloe juice should be taken every day, three times a day, 20-30 minutes before main meals (breakfast, lunch and dinner). This while stocks last and at least once a year. Then it depends on the reasons why you want to hire it, if it is only as a precaution, or if for more serious reasons. For more information, I recommend reading the book by Father Zago " Cancer Can Be Cured ", which talks about how, when and why to take Aloe juice. Where to buy fresh Aloe juice? Well for that we are here. My farm, besides cultivating and selling Aloe Vera and Aloe Arborescens plants, is specialized precisely in the production of fresh Aloe juices , following step by step the original recipe of Father Romano Zago. 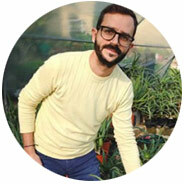 To do this we use only Italian plants, growing in our fields in Fermo, using organic farming techniques, without the use of chemicals. For more info on our crops you can take a look at my Istagram page . The juice is produced to order , always and only early in the morning before sunrise, picking up the leaves by hand and working them in the darkroom, just as the Brazilian friar also recommends. The smoothie contains only honey and distilled (possibly we also provide a version without alcohol), and contains no preservatives, is not pasteurized and is not filtered . Then it is shipped the same day and within one day, it arrives at the client's home, ready to be consumed. Like any other natural remedy or supplement, Aloe can also have contraindications . 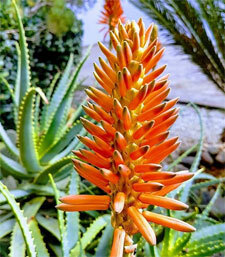 Due to the presence of aloin, a substance with marked laxative action (especially during the first days), Aloe juice is contraindicated to all those people suffering from inflammatory diseases of the intestine and colon, such as: Crohn's disease, ulcerative colitis , colitis, diverticulitis. In these cases it is however possible to take the filtered recipe, without peel and without aloin . In addition, Aloe is contraindicated to pregnant or breastfeeding women and to organ transplant recipients .